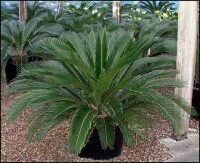 This unique plant resembles a palm tree but is actually a cycad. These living fossils, members of the Cycadaceae family, dominated the landscape during the Mesozoic era over 150 million years ago. Today about 10 genera of cycads still survive. 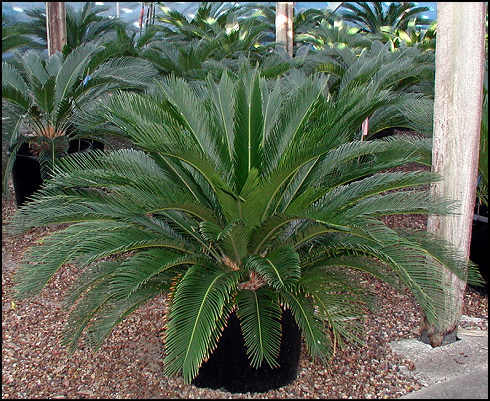 The most commonly grown is the Japanese sago, also called the sago palm (though again, it isn't really a palm). This symmetrical plant supports a crown of shiny dark green leaves on a thick shaggy trunk that can grow to 10-12 ft high. The plant is very slow growing requiring about 50 years to achieve this height. As the plant matures branching of the thick stem may occur which only adds to the interest and charm of this beauty. Japanese sago also tends to produce suckers at its base forming a large multi-stem clump over time.